Target your visitors, set your budget and control your rates are just few of your high quality advantages of becoming a Pop Ads advertiser. What Is Pop Up Advertising? Pop-under ads are similar to pop-up ads, but the ad window appears hidden behind the main browser window rather than superimposed in front of it. 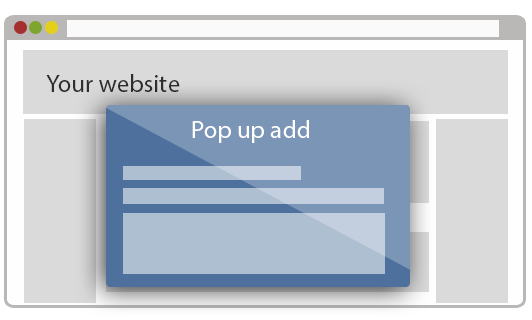 As pop-up ads became widespread and took up whole computer screens, many users immediately close the popup ads that appeared over a site without looking at them. 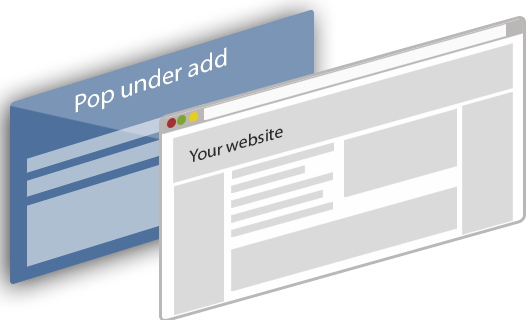 Pop-under ads do not immediately impede a user's ability to view the site content, and thus usually remain unnoticed until the main browser window is closed or minimized, leaving the user's attention free for the advertisement.